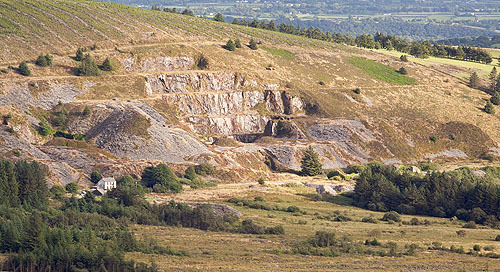 A view of Bellstone Quarry and Rosebush Quarry from Foel Eyr. Bellstone Quarry , an area of about 500m by 250m , worked from 1825 to 1891. Rosebush Slate , to the south of Bellstone , an area of about 300m by 200m , worked from 1842 to1900.